The new B.C. Southern Interior is a high-resolution Landsat 7 image with overlaid map information. The map detail consists of main highways and secondary highways as well as parks, lakes and mountain recreation areas. Most communities of a thousand or more are shown, along with prominent mountains, provincial and national park boundaries and other locations of interest. The result is a stunningly beautiful production which is highly informative at the same time. 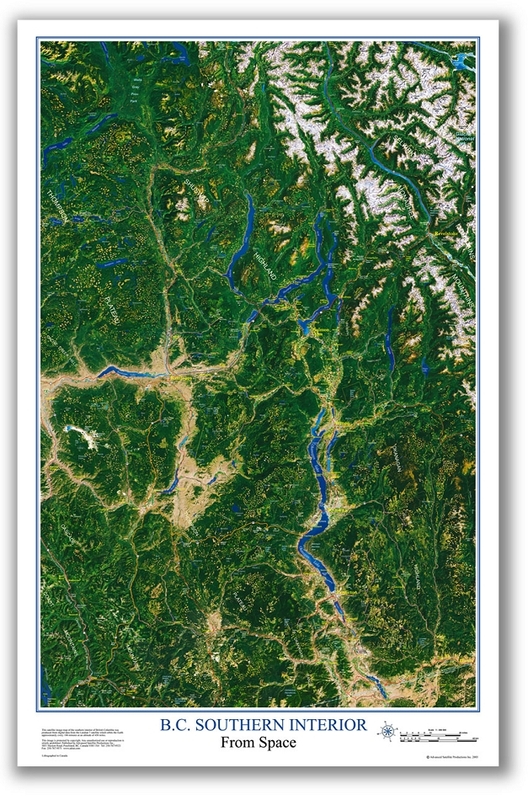 The terrain covered reaches from Revelstoke on the east to Hope on the west, and from Osoyoos at the U.S. border as far north as Wells Gray Park. Feature: 25 in. by 39.5 in. Feature: Scale 1 : 260 000 Approx.